There are a lot of subscription coffee services around at the moment. It’s quite the thing, and a definite sign that more people are waking up to the complexities and intricacies that separate a mediocre cup of coffee from a good cup of coffee from a truly superb one. The idea is simple – hook into a subscription, pay a few quid a month, coffee arrives at your door. It’s a very effective model, and a good way for the people to easily access some interesting and unusual beans. 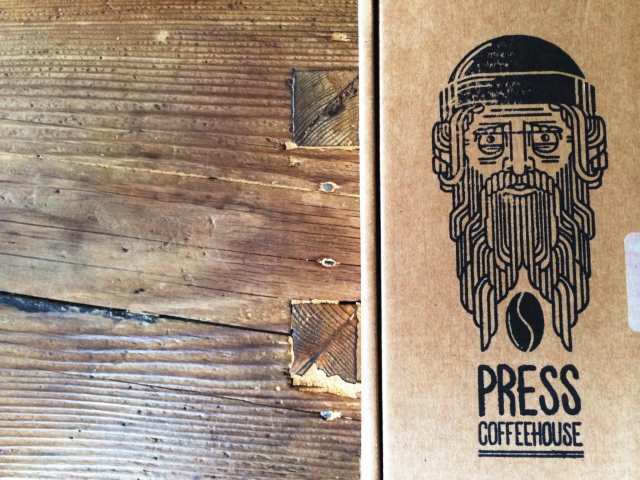 This is what Press Coffeehouse from Harrogate do, but with a few little twists. The first thing is packaging. Coffee packaging is nice. It’s a hip little creative industry, and design is important. Seems a shame to waste it by re-bagging beans from some uber-fashionable far-flung coffee roaster into boring bags that just happen to be shaped so that they fit through a letterbox. It’s surely better to present the beans in the way that the roaster intended, because you would be safe in betting your house that that little hip artisan roaster in some back street in Barcelona agonised for days over the design of the bag their lovingly roasted beans ended up in. Press reckon you should enjoy that bag, and so do I, but there’s also the matter of the coffee itself, so a set of cupping notes are included, along with a couple of complementary recipes. There’s also a little extra sweetener each month, something food, art or design centred. This month brought a box of sea salt and orange almond caramel from the sublime Noisette Bakehouse. All of this is ace, but the whole enterprise stands or falls on the coffee itself. It’s absolutely no use passing off rubbish beans in fabulously designed packaging. It just doesn’t wash. This is definitely not the case here. This month’s brew was from Joe Roasting in New York, a beautiful bag of Costa Rican Cafetin San Martin, and there have been roasts from outfits such as Five Elephant in Berlin, White Label in Amsterdam and Madcap from Michigan. The idea is that there will be beans from well established and respected roasters alongside beans from new start-ups or little niche roasters. That diversity of product is the thing that interests me most about Press Coffeehouse’s subscriptions, that opportunity to uncover something quite different and unique. Even better that it gets delivered straight to my door. Excellent and exciting coffee, a few sneaky little extras and a careful eye for the way the design of it all fits together. Not a bad effort, Press Coffeehouse.